Professionally decorated, Fully Furnished and Beautifully remodeled 1st floor condominium. Everything is included. Brand new kitchen, appliances, bathroom, flooring, lighting. Truly a stunning renovation. Contemporary kitchen with granite counter tops, beautiful marble backsplash and stainless steel appliances. New kitchen has plenty of storage and a wine cooler. Beautiful decorative molding in dining room. Bathroom has brand new shower with seat, frameless glass doors and marble mosiac. Just move right in. CBS Construction. Great Tequesta location. Little club has a community pool, golf, social gatherings, Bocce and more. Only 25 min to Palm Beach Airport. Little Club is a 55+ community. No Rentals 1st year. HOA Approval for buyers. All sizes approx. Low Martin County Taxes. Village At Abacoa: Experience the unique lifestyle in downtown Abacoa in this 3rd floor Studio apartment. It offers a spacious living area with natural light and covered balcony w/SE exposure. Other features incl high ceilings, impact windows, good size kitchen, deep walk-in closet, stacked W/D in unit. Newer AC, WH and disposal. Pet friendly, 24/7 Secure bldg entry, parking spot #275, and low HOA! Easy lifestyle w/minimum maintenance. Perfect for homeowner, vacation home, or rental! Best location on the quiet side of town center and not above any restaurants or bars. Close to Abacoa Police Station, Walk to Roger Dean Stadium, FAU campus, Scripps, Max Planck, restaurants, shops - so much more! Great property for anyone who enjoys spending winters in a tropical Florida paradise! Village At Abacoa Condo: Quiet Studio for Sale. Located in downtown Abacoa. Walk-in Closet, Dishwasher, Washer/Dryer. HOA includes Cable, WIFI, Fitness Center, Exterior Maintenance and Insurance, Pool, Trash Removal, Common Area and Elevator. Walking distance to Scripps, Max Planck, FAU, Roger Dean Stadium and many stores and restaurants. Chasewood: Welcome to Jupiter! This cozy second floor condo unit located in Chasewood is the perfect home for new families, retirees, single professionals or part time residents. Great location close to major freeways. The local district offers a remarkable opportunity to attend A-rated public schools. Community is primarily owner occupants, the association is well managed, and this unit is priced perfectly for any Buyer who prefers a designer ready unit. Rental restrictions during initial years of ownership. Please feel free to text the listing agents with questions or to easily schedule a showing. This opportunity will not last. Association Fee includes water, basic cable, common area, and amenities. Chasewood: Original owner well cared for unit. Can be purchased furnished.. Although not the latest styles, very lightly used and in GREAT condition. Wall taken down to make a One Bedroom, could easily be added to revert back to a 2 BR. Master features walk-in closet, sliding glass doors to screened patio and great view of the green space. Very close to the pool and entry. Ons-site management and reasonable COA fees make this a must see! Jerry Thomas Elementary, Independence Middle and Jupiter Highschool. Centrally located only minutes to interstate and under 15 min. to beach. Close to Roger Dean Stadium, home of the Spring Training for St. Louis Cardinals. RV Storage in community - Buyer to check availability. a real paradise with a 18 hole Tom Fazio golf course. The flooring is marble 20x20 in living area . Pergo flooring in the bed room. Bath rooms updated. Newer appliances A/C and H2o tank. Accordionhurricane shutters. The condo is leased for $ 3500 a month for the 2019 season. Can be transferred to new owners. Condo facing with two balconies the 12th tee box and the most fantastic Sunsets. Beautiful decorated, furnitures are negotiable. Mandatory golf membership $ 625 Qt. Bring offers must sell. 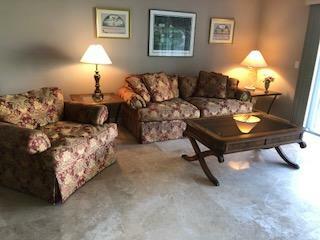 Pines Of Jupiter: 2nd floor unit in Pines of Jupiter. 2 beds and 2 baths. Large balcony. Great location. Unit would make good starter unit or investment. THIS 1ST FLOOR UNIT IS LOCATED IN A 55+ COMMUNITY & OVERLOOKS THE GOLF COURSE. BOTH BEDROOMS AND LIVING ROOM SLIDERS OPEN TO A LARGE SCREENED PATIO. LARGE WALKIN CLOSETS & LAUNDRY ROOM WITH FULL SIZE PANTRY. BEAUTIFUL COMMUNITY POOL & CLUBHOUSE WITHIN WALKING DISTANCE. Abacoa: First floor 1 bedroom unit in the quiet section of Abacoa Town Center. Great investment property. Tenant in place until end of May. Rent is $1250 per month. Tenant would like to renew if possible. Tenant has been in place 3 years...NO ISSUES!! One designated parking spot in front of unit. Walk to pool, gym, Roger Dean Stadium and the Town Center. Chasewood: Lovely 2/2 is located in popular Chasewood. This second floor unit has high ceilings and is light and bright. It boasts granite counter tops, tile floors, newer appliances, fresh paint, walk-in closet and updated vanities in the bathroom along with a new AC. This unit has a lovely view of a park and green area. No looking at the parking lot from your balcony. Move right in and enjoy the serene view. Chasewood: Stunning renovated 1st floor 2/2 condo unit. Brand new kitchen cabinets with granite tops & stainless appliances. New laminated flooring and light fixtures. Freshly painted and move in ready. Screened porch with small storage closet. Very private. 2 assigned parking spaces. Pet friendly. Community clubhouse, pool, tennis courts and car wash area. Very reasonable HOA fee includes water, basic cable and all amenities. Located just minutes from beaches, shopping, restaurants, golf, Publix, Starbucks ,I-95, Turnpike, and great schools. No lease restrictions for tenant occupancy. Chasewood: Nice first floor unit. Situated close to shopping and Jupiter's beautiful beaches and parks. Updated kitchen, new carpet, freshly painted, plantation shutters on windows and sliding doors. California closet in Master bedroom. Storm shutters. Chasewood: Cozy upstairs corner unit. Has 2 bedrooms and 2 bathrooms. Tiled flooring, kitchen has granite counter-top and tiled back-splash with wooden cabinets and stainless steel appliances. Unit is just right next to the community tennis court and just across the community pool. Great area, near I-95 and turnpike! North Fork: Riverbend, Jupiter/Tequesta's best kept secret. Conveniently located 20 minutes from PBI, shopping, beaches, outlet mall. Sits on Fazio designed 18 hole golf course, swimming pool, clay tennis courts, pickle ball, clubhouse and pro shop. This unit was COMPLETELY RENOVATED and updated with state of the art SS Samsung appliance package including french door refrigerator, slide in range, SS hood, dishwasher and micro. New LG full size stack washer/dryer. 24x24 porcelain tile throughout. Private balcony off master and screen balcony off living room. Open concept with custom wood, shaker style cabinets, raised ceilings. New water heater,New AC, R-30 attic insulation. Offers the most desirable expansive golf course view with ultimate privacy. A MUST SEE. If you're searching for a great condominium in Jupiter, do not miss out on this light and bright GROUND floor unit in the centrally located over 55 community of Wingfoot. This 2 bed/2 bath unit has large master bedrooms with en-suite bathrooms and huge walk in closets. Both bedrooms provide access to a lovely oversized screened in porch. Important to mention is the ever so convenient storage closet on the screened in porch!The eat in kitchen complete with pantry and full size washer & dryer has great counter space and cabinets. Wingfoot is adjacent to an 18 hole public golf course and restaurant. A full clubhouse and pool add to the wonderful amenities of this well maintained community. Call us NOW to view 101 Wingfoot B! Keystone: Best Value in Jupiter! 2nd floor located on the Golf Course! Vaulted ceilings, easy parking in front of the building, more guest parking than you can imagine! Pets welcome with restrictions. Clubhouse with heated pool. Miles of biking and walking trails. Excellent, convenient location, close to I-95 and the Turnpike, Restaurants and Beaches! No lease first year. Indian Creek: Move right in into this beautifully maintained second floor, split-bedroom condo with views of the golf course and beautiful sunsets! Endless storage and newer kitchen cabinets, countertops, and appliances- accordion hurricane shutters, AC 2017, roof is covered by HOA.The perfect location, the potential for this condo is endless. Close to I-95, Turnpike, shopping, dining, and golf, this low-maintenance 55+ community is the perfect tranquil retreat without giving up convenience. Make new friends in this social community.